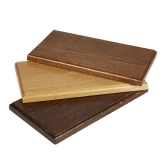 We can supply external quality hardwood backing boards to compliment your signs and nameplates. We use solid oak in light, medium and dark stained finishes but we can also supply other hardwoods such as beech, mahogany and cherry wood. Boards are made to order with a standard bevelled edge. We can also supply painted boards in black gloss. We have a range of backing boards in a number of sizes suitable for internal signs and nameplates, we can also use these boards for making bespoke trophies or awards.